The manufacturer and the name of the aircraft being hoisted? A particular feature of this aircraft that was unique? The month and year the photograph was taken? Correct answers were received from Mr Ian Parrott of Nowra and Mr Kim Dunstan of Melbourne. Before answering the questions, note the ‘cocooned Sea Venom aircraft also on the flight deck. These aircraft were transported to Hawker de Havilland’s at Bankstown where they were restored to a flying state for the RAN. The main photograph is of Avro 707 WD280 being loaded to/from HMAS Melbourne in May of 1956. 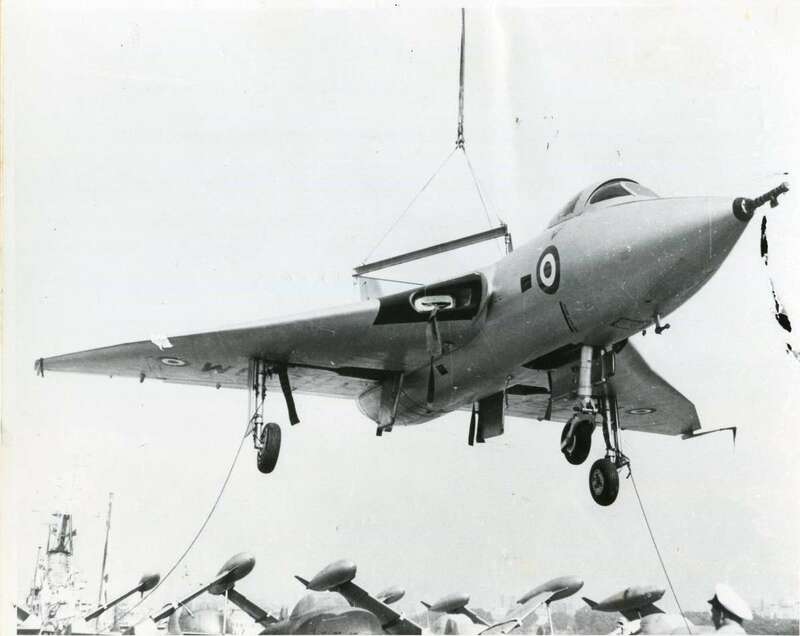 The aircraft had been brought from England and it was unique in that it had a delta wing configuration, and was a one-third size prototype of an aircraft under development at the time. Glen Hartig, who was an Aircraft Handler aboard Melbourne at the time, remembers it being loaded into the hangar. It was an odd size and apparently lots of liquid soap was needed to slide it off the lift into the hangar deck. The 707 was conceived as part of the V-Bomber project to supply a new fleet of strategic bombers for the Royal Air Force. 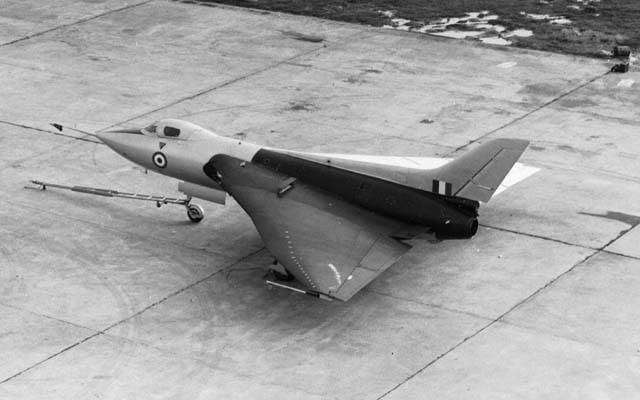 The purpose of the 707 was to test the aerodynamics of what was to become the Avro 698 Vulcan, and in particular, its delta wing and ‘tail-plane less design’ concept. Left. Another shot of WD280 in 1958. You can see the ‘kink’ in the leading edge of the delta wing. Photo via John Hopton through Aeroflight. The theory of the delta wing, which offered a number of advantages at high speed, were understood, but a platform was required that allowed real data to be gained – particularly about its low speed characteristics. 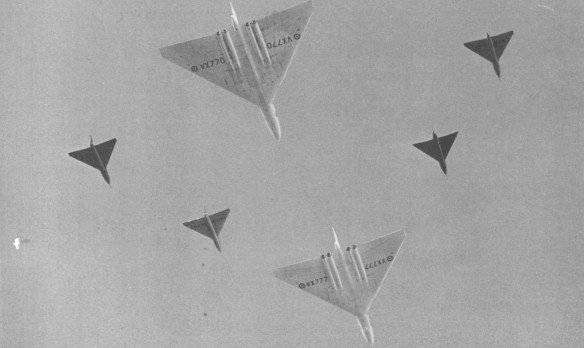 Avro therefore decided to build one-third size scale models of the Vulcan for low speed research. There was also an intent to build one-half size prototypes but this never went ahead. Five of the one-third size models were constructed. The first simplified version made its maiden flight at Boscombe Down in the UK on 4 September 1949. Unfortunately the test pilot lost his life two days later when the aircraft stalled, probably as a result of the air brakes locking open following a control circuit failure. Subsequent models were about 12 feet longer with significant modifications including a different degree of leading edge sweep and modified elevators and air brakes. The cockpit was modeled on the Gloster Meteor, the undercarriage on the Avro Athena and the nose leg on the Hawker P.1052…a sort of hybrid test bed. The maiden flight of the second aircraft occurred on 5 September 1950. This aircraft provided valuable data but was scrapped after two accidents, one of which was at the hands of an Empire Test Pilot student. 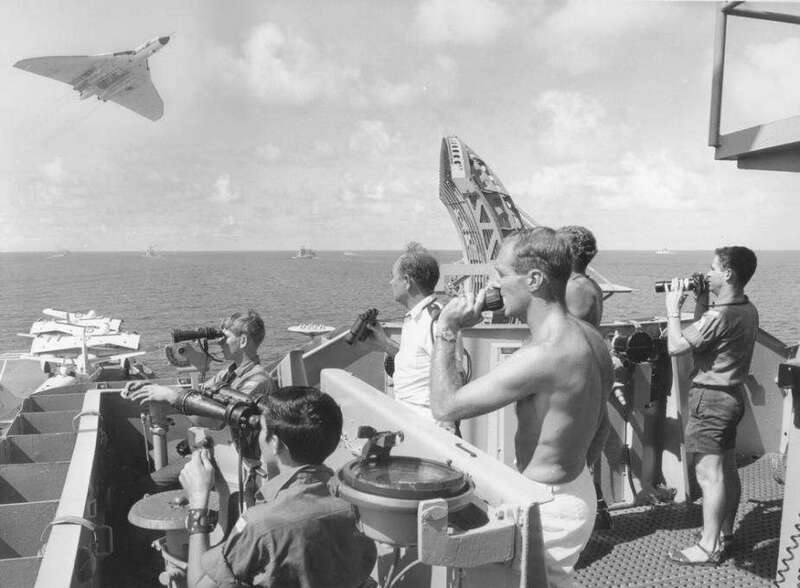 The third aircraft, which is that shown in the Mystery Photo, carried several other modifications including a partially pressurized cockpit and a ‘kinked’ leading edge (which was adopted in the Vulcan). In 1956 WD280 was assigned to the Australian Aeronautical Research Council (AARC) and was shipped on HMAS Melbourne to Australia, where low speed trails were conducted at RAAF Laverton. On 10 February 1967 WD280 was struck off charge and sold to a local resident who kept it in his back garden. 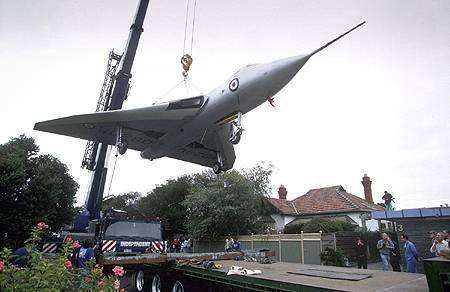 It was bought by the RAAF museum in 1999 and moved to Point Cook, where it is now on display. Left: Airborne for the last time. WD280 being moved from the suburban back garden where it had rested for some 30 years. Left: A neat circle. Having carried its baby prototype many years before, Melbourne is overflown by Mum. 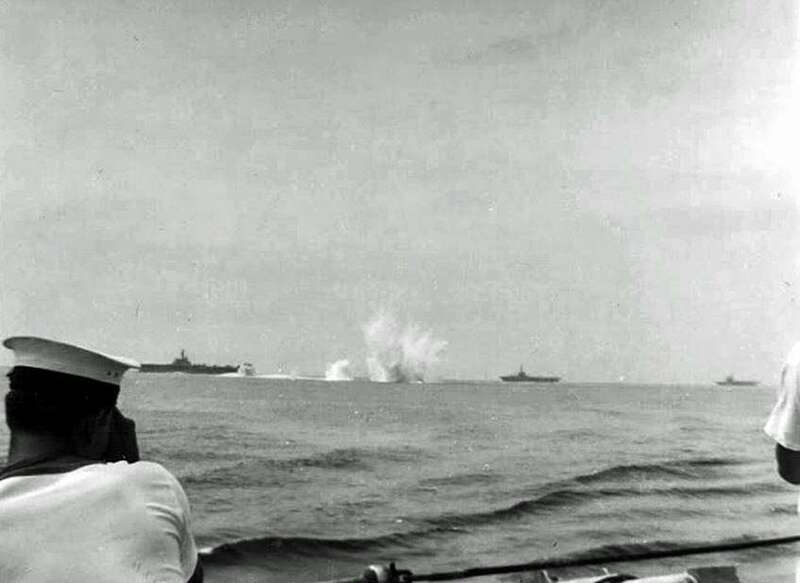 Left: The Vulcan’s bomb run between carriers HMS Eagle, Victorious, Bulwark and HMAS Melbourne during SEATO Exercise FOTEX March 15-25 1965 off the west coast of Malaysia. Photo: John T.Simm, Scotland on HMS London. Left. 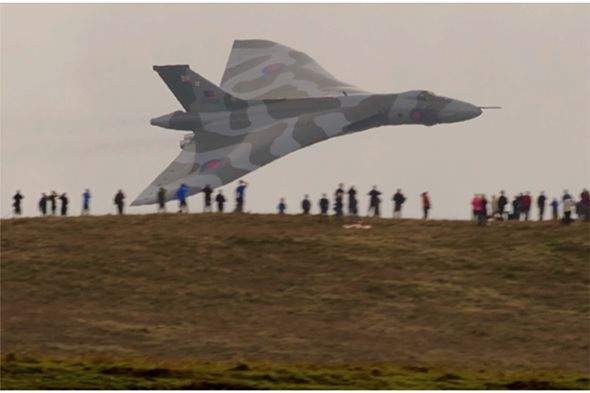 An awesome photograph of a Vulcan conducting a low level pass at an unknown location in the UK. Below. Power and Grace. 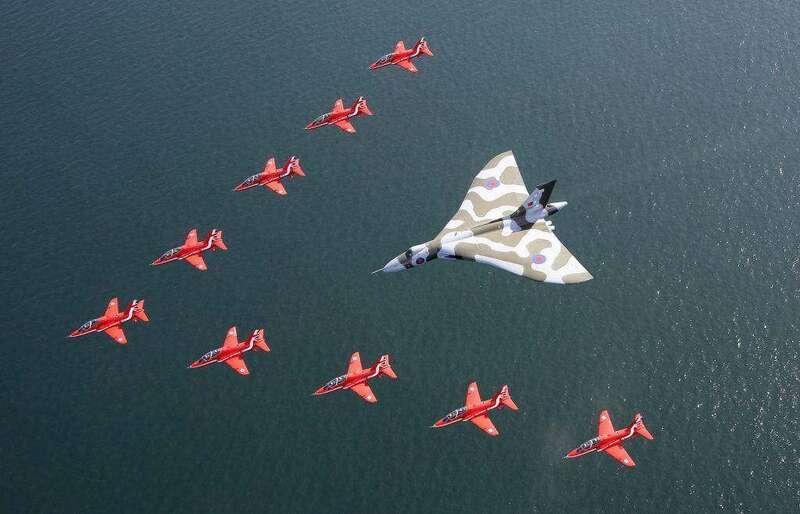 The Vulcan bomber was arguably one of the most beautiful aircraft in the skies at the time. Here the sole remaining airworthy specimen is shown in company with the RAF’s Red Arrow aerobatic team on its final flypast on 19 September 2015. A great video of the Vulcan flying at Farnborough can be seen here.